COME ON, NOT AGAIN. 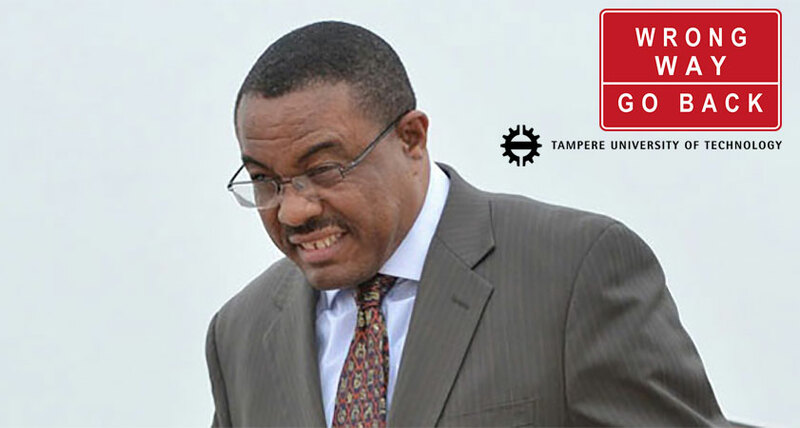 Tampere University of Technology of Finland withdrew PM Hailemariam Desalegn’s nomination for honorary degree. The Tampere University of Technology (TUT) in Finland rescinded the honorary doctorate degree it was scheduled to award to Ethiopia’s prime minister Halemariam Desalegn following a relentless campaign by Ethiopians in the Diaspora who believe a man at the helm of a brutal regime does not deserve such recognition. A campaign by the Ethiopian community in Finland and all over the globe has forced the University to remove the announcement of the award from its website. The University simply informed the Ethiopian community that PM Hailemariam will not attend the event. The Ethiopian community representatives in Finland last month wrote a letter saying the Prime Minister does not deserve such an award as he is part of regime that terrorizes its own people. An alumnus of TUT, Hailemariam Desalegn graduated in 1992 with MSc in Sanitation Engineering. In 2014, Azusa Pacific University (APU) withdrew the honor bestowed upon Hailemariam following a relentless campaigned by activists. The University said it withdrew the honor after thorough consideration of the human rights violation perpetrated by the Ethiopian regime to which Hailemariam is a key player. The Board does not speak anywhere in this message of any decision to award the honorary degree to Hailemariam Desalegn at a future date. Conferment of doctoral degree by TUT occurs every fifth year. Is the university to keep for Hailemariam Desalegn the said award for next five years until the next conferment cycle? Such questions have persuaded the members of the Community that the University authorities are protecting the actors in this exercise from present and future blames. As any analytical mind could see, the two sentences by the TUT Academic Board, reflecting its decision and Hailemariam’s desire, cannot naturally go hand in hand. Let this situation not hide from memory at any moment. No worries Finish University, your dear PM Hailemariam will still have his Honorary Degree at the Koshe University. This is embarrassing. He like to be called Dr Hailemariam Desalegn, eh? Why not this poor chap follow the footsteps of Dr. Arkebe and House Speaker Abadula Gemeda? Why not he buy his doctorate from online? There is always a discount if he was referred by former online degree buyer. I will try to send this poor soul the link so he could place an express order PhD online, so he could finally be one among the equals. This happened for the 2nd time. I remember about 2 years ago the Azusa Pacific University in California withdrawing the honorary degree it initially offered this TPLF PM. My question is: Is TPLF paying for this type of degrees? We know these honorary degrees from western universities are not usually given to African leaders. However, this idiot PM was offered 2 of them in 2 years. I hope someone is looking into this; possible a great research paper for Phd candidate. Oh, what a silly extreme diaspora Ethiopia has! Ethiopia government and of course our PM HD has got a recognition and blessing from majority Ethiopians. from we have no time attitude our government doing a lot of work to change the country into africa light manufacturing hub. Instead these no good for nothing extreme diaspora celebrated with little they have what a sad creatures. Ayte Ethio interesting you opted to draw the Ethiopian card right now, what about that little shrouded MLLT identity, your PM is only a pig with an ugly lipstick of the antiquated clique. Soon will your country be Africa´s beggar hub. Poor you, What you and other pro PFDJ people fail to realize is that there was no better time other than right now to celebrate the real Ethiopian spirit that answer the long awaited constitutional governance, self administration, the right to promote all culture & linguistic equally etc..
“constitutional rule” a la Dedebit, you must be kidding do you hear the voice of the masses, the voice of real Ethiopians who are ready to take back their country and make amicable relationship with their Horn neighbors. And then you can apply a constitutional rule in your tiny Kilil. Ethiopians don’t mind peaceful transitional power only through election and ballot box if indeed there is a better opposition political candidate than the current government but until to day it’s no avail. We are proud what we have and move on to the bright future. There is no space to one king administration around hear. Oh how pathetic and ridiiculous you sound who will buy such a droppings by a MLLT caliber, when every one knows the clique where you came from are ruling the nation with iron feast you call it peaceful transition. Ayte ugum save us your dedebit analyses it has no room here in our sites sell it in TOL aiga or Walta. Whether you and your Kilil has a bright future remains to be seen after the 96% none weyane Ethiopians take back their nation in not too distant future. your PM Desalegn only can have recognition from Koshe university ,MR Ethio ,you don’t even care about your people .Did I read it wright ” An alumnus of TUT, Hailemariam Desalegn graduated in 1992 with MSc in Sanitation Engineering.” What kid of SANITATION Engineering is talking about?It is not even a month ago according BBC 113 people died from garbage avalanche.Don’t try to justify a blessing to your PM and cruse for the people of Ethiopia . He looks like he just stole something, in that picture. Ironic. The man has masters degree in sanitation and 200 of his people vanish under mismanaged rubish. God save Ethiopia. So keep calm and enjoy Wonaye- Tigray dominance and success. መጪው ጊዜ ከ ወያኔ እሕአዴግ ጋር ብሩህ ነው ! The Tampere University of Technology (TUT) was about to honor the Ethiopian tyrant with honorary doctorate degree. This action by the university has caused offense and there is a feeling apology is in order. The decision to confer on the Ethiopian prime minister honorary doctoral degree was made already a while ago, although the decision to rescind it is influenced by the political situation in the country. The Tampere University of Technology was at a point literally to give the honor to Ethiopian Prime Minister Hailemariam Desalegn, whose regime has been constantly accused of the crimes of human rights violations. The President of the Tampere University of Technology Mika Hannula says the decision to award the prime minister was made at the end of last August. The university claims this was based on consideration of the significant merits in the development of water supply and the promotion of sustainable development. Hailemariam Desalegn completed his education to obtain an MSc in Water Technology. He is remembered as a hard-working student, the Helsignin Sanomat was told nearly two years ago. [It is not indicated who told the paper this two years ago]. For several years, Finland has given Ethiopia development aid associated with water supply development. The President of the University maintains that the TUT Academic Body reversed its August decision, because the prime minister could not be here. Accordingly, he says, “Last week, a representative of the prime minister indicated that he would withdraw. Acceptance of the withdrawal, according to Hannula, was accepted last Monday as part of the decision of the Academic Board not to award him the degree. As it happens, Mika Hannula claims, while largely the political situation in Ethiopia/1 has influenced the Academic Board’s decision, Hailemariam’s inability to attend the ceremony at Tampere has also become factor in its cancellation. It is reported that in recent years the university has been closely following the situation in Ethiopia. “In particular, the proclamation of a state of emergency, of course, took the university to reconsider its position,” says Hannula. The Ethiopian government declared a state of emergency last October, when the government followed the course of suppressing the mass protests in the country that has run for almost a year. During the state of emergency, The Guardian reported, mass arrests of at least 25,000 people. Hailemariam Desalegn is a leader of the ruling EPRDF, which holds all the seats in parliament. The only representative of the opposition in parliament also lost his seat in the 2015 election. Consequently, the victory by the ruling party of one hundred percent of the election results has been attributed mainly to effective silencing of the opposition. This situation in Ethiopia has been a preoccupation for many nations. For example, the US State Department last October expressed the concern that the state of emergency was empowering the ruling party to arrest without warrants, tighter restrictions on freedom of expression, as well as curfews and bans on freedom of assembly. As far as the question of the honorary degree is concerned, President Hannula says, it does not get rescinded automatically when the recipient cannot make to the place of the ceremony. “The practice varies on a case by case basis however,” he says. Ethiopians living in Finland are displeased with the fact that the tyrant Hailemariam Desalegn was even considered to receive such an honor from the Tampere University of Technology. One such resident is, a startup entrepreneur Michael Argaw, who has demanded an apology from the University in a twitter message for that. In his opinion, it is not enough that the conferment is cancelled for whatever reason. Desalegne has run a system of governance in which people are arrested, disappearances are common and also killings by the state, wrote Human Rights Watch. Those criticizing the ruling party are sent to prison, without court decisions. Many Ethiopians have been driven by the ruling party’s actions into exile. kkkk ጆሮ መቼም የማይሰማው ጉድ የለም ! since when is PM H Desalegn has become a tyrant ? You enemies can call this humble, honest, academic ,and technocrat Ethiopian leader any names but assigning him the “tyrant” title is definitely out of touch with the reality. If our PM is a tyrant, then what can you call your abuser the President for life of the tiny state of Eritrea ? I don’t comment usually for everything here like other people for instance,(sentiko or Mr. logic /an obtuse pesron) , but I know for sure I’m following one person here that is Ayte sentko/sentk whatever his nick name is I don’t see him now. He used to come every mint every day to comment /childish comment here. Ayte sentiko I know your new nick name believe me I’m Amharic speaker too!! You start writing in Amharic you know who I’m referring now!! I’ll follow you everywhere. I know your Idea and who you are supporting here.